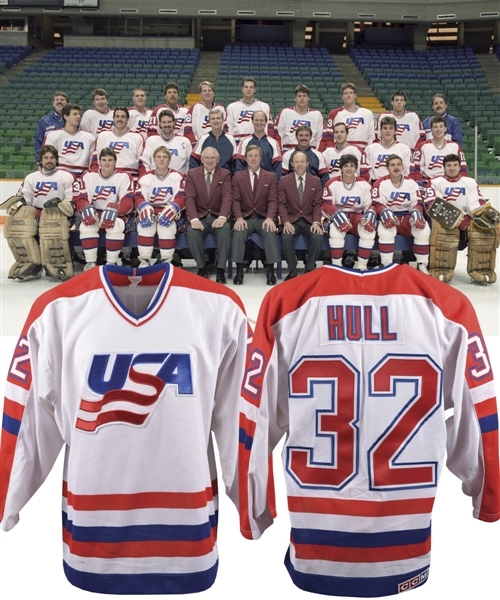 Representing the US throughout his career at the World Championships, World Cup and Olympic Games, Brett Hull first wore the red, white and blue in 1986 at the Calgary Cup. 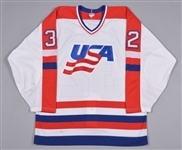 Choosing Chris Nilan over Hull for the US squad’s final roster the following year at the 1987 Canada Cup, Hull did take part in the pre-tournament games, wearing this Team USA jersey. A crumpled CCM label sits along the collar with handwritten “50” sizing, with an embroidered CCM patch (with registered trademark symbol) over the reverse bottom hem. Styled with an attractive and textured USA team crest, the solid white V-neck has been accented with tri-colour sleeve and verso numbers, with “Hull” across the affixed nameplate. With just a few dark marks over the lower front and sleeves, the jersey remains in wonderful condition. A signed LOA from Brett Hull will accompany.